Make up coconut milk or cream with this versatile ingredient made with real coconut, that brings you consistency in preparation and taste, ensuring that every chef can easily create perfect savoury and sweet signature dishes. To make up 1 L of Coconut milk, combine 150 g of KNORR Coconut Milk Powder with 850 ml of warm water. 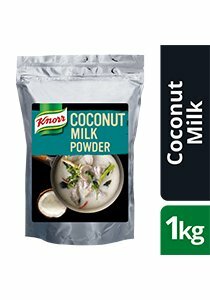 For coconut cream, add an additional 150 g of KNORR Coconut Milk Powder. Weight 1 kg per bag. Weight per serving/portion 22.5 g dry weight. Made with real coconut. Instant. Store in a cool, dry place away from direct sun light. Re-seal pack after opening.